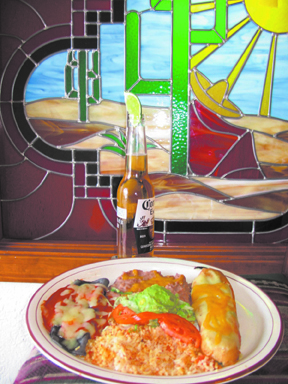 The Finest of New Mexican Food Prepared in our Traditional Way. Spice up your evening with delicious, fresh, and savory New Mexican dishes that will keep you coming back for seconds. For over 25 years, Martin's Capitol Café has been committed to serving the Chaves County community and its surrounding areas with quality New Mexican food blended with a fun, family-style atmosphere. Serving up mouthwatering rellenos, tamales, burritos, enchiladas, sopaipillas, and other classic New Mexican entrees, each dish is made from scratch and offers a satisfying experience for both you and your taste-buds. We use the finest and freshest ingredients for every dish that comes out of our kitchen. The star of most of our dishes is the red or green chile that is grown in the New Mexico region. The preparation and method of preparing the chile is what makes New Mexican food so unique and our restaurant so authentic. Our staff works to ensure that every customer receives the best service and leaves satisfied with their entire experience. We offer great breakfast, lunch, and dinner specials throughout the week, as well as a full carry out menu and catering services. Whether you're looking to dine in or take out, when you want a great authentic New Mexican meal, grab your friends and experience Martin's Capitol Café! We look forward to serving you. Awarded the 2014 Award of Excellence for "Best in Southeast New Mexico" Presented by Roswell Daily Record Travel & Dining Guide! Awarded the Best Green Chili Cheeseburger in the Roswell Dining Guide!